1 snack bowl of bran flakes with fruit and nut with soya milk. Vital Ingredient ‘Create Your Own’ Breakfast bowl with pomegranate seeds, blueberries, strawberries and granola with natural yoghurt. Finally got a chance to eat in Vegetarian restaurant, Mildred’s on Lexington Street (near Soho) today for lunch. You can try this even if you are not a vegetarian, but don´t be surprised if you have to wait for a table. The place is popular and crowded. The food was varied in choice, unpretentious but super tasty and invariably high quality. For starters, I shared the deep fried chinese dumplings tossed in ginger, garlic and chilli with kim chi, and mains included the Sri Lankan sweet potato and cashew nut curry with yellow basmati rice with peas and coconut tomato sambal and it was MASSIVE. Huge, super filling and awesome. The curry dish was packed with good carbohydrates – rice and lots of sweet potato, and the thick tomato sambal on the side had tomato, cilantro and a hint of coconut that provides freshness to the dish. All the food coming out of the kitchen and on the menu looked great and there were a large variety of different types of food. Ranging from adventurous salads, to mexican including burritos, to halloumi burgers and fresh tortelloni filled with pumpkin and ricotta – pretty much anything under the sun! The restaurant can be extremely busy (there were two couples before us when we arrived) and you can have to wait for a table, we did. Mildred’s don’t take bookings. Plus, don’t expect to have an intimate moment with a date or friend – the table were about an inch apart and we had to share with someone. I would still definitely return to Mildred’s next time for a hearty meat-free meal! 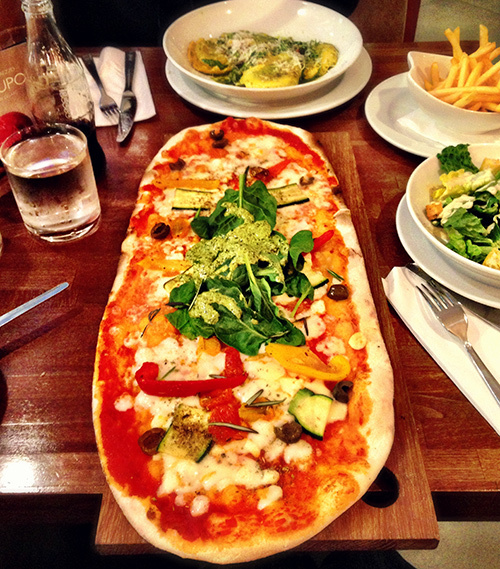 It was my first time at Prezzo for a meal. I ordered the Vegetarian pizza on a VIP pizza base (crispier pizza, supposedly with more toppings, served on wooden board with your very own pizza cutter (there wasn’t a cutter!?). The pizza was huge – topped with a few slices of pepper (two red, three yellow), pieces of courgette cut in to five slices and a few baby tomatoes cut in half, all topped off with spinach with pesto on – the veg toppings weren’t as generous as I thought. The pizza base was just how I like it: thin, crispy, and not overly-loaded up on cheese. Eating out tip! Eating out as a veggie can be easy if you’re prepared. Checking out the menu online (I checked Prezzo’s menu before going) or phoning the restaurant before you go saves time. Most places will prepare something for you with enough notice, and normally you can adapt dishes if there are not vegan options listed.